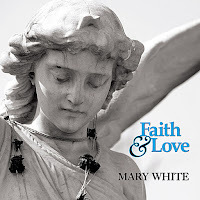 HeirChex Digital Servicing: Mary White "Faith & Love"
Singer, songwriter and musician Mary White is a rising star on the country music scene; her music shines through her soulful southern voice. Mary's energy on stage is contagious and her diversity amazing. Mary plays guitar, keyboards and saxophone and appeals to all musical preferences while mesmerizing you with her pure talent. As a songwriter, Mary has written more than 300 songs and has earned a solid reputation and following as one of the Southwest's hottest, rising country artists. Her CD "Change of Pace" has an originality of country rhythm and rock that surrounds you and draws you in, leaving you always wanting more. Mary grew up in a musical family and started singing with her mother at festivals and in church. When she arrived in LA from her hometown of Longview, Texas, she began performing at local clubs, festivals and coffeehouses. Her music itself is a smooth combination of intelligent songwriting and depth-digging vocal tones. The result is wide-open musical instinct and a talent that speaks for itself. Mary continues to create her own musical style. Mary's music is a smooth combination of intensity, wisdom and insightfulness created by her exceptional songwriting and passionate vocals, and on stage, she's pure energy, and sings with a smile in her voice. Mary White not only provides great music for fans in the Southwest, but was fortunate enough to be selected by the United States Armed Forces MWR to tour South Korea and Guantanamo Bay, Cuba to entertain the troops and spectators alike from all reaches of the globe. HBO picked up one of Mary's songs "Take Me Back to Oklahoma" which aired in the movie "The Gristle". "Take Me Back to Oklahoma" has also been on radio stations in Texas, Oklahoma & California. Mary has produced, engineered and written several songs for various film and television projects such as "Nothing Like a Country Girl" which was featured in the movie "Elvis Has Left the Building" starring Tom Hanks & Kim Bassinger. As well as worked with several production companies such as Film Roman, and the production companies for King of the Hill, The Simpsons and Todd Stevens, Executive Producer of Friends. Mary has also produced an extensive list of commercials. Mary is currently living in the Los Angeles area, writing and performing locally. She is the owner of a successful recording studio, QP Sound, producing and engineering numerous artists and CD's. If you enjoy great music, energy you can't contain and songs from the heart, you will want to play her CD or better yet catch her live; you'll be amazed at what this girl can do.